Although you don’t need to have a garden or even grass on your property to know about weeds, if you have either, then you know just how frustrating weeds can be – they certainly add some time to your lawn and garden maintenance and can take away from the aesthetics of your home! However, there are some weeds that don’t look as if they’re just poking up from the ground to get in the way, and in fact, some beginner gardeners may not even realize that they’re actually a weed at all – here, we’re talking about flowering weeds. Black nightshades are classified as broadleaf annuals, and they are commonly found in lawns and/or gardens that have really rich soil. These weeds are visually described as being climbing or bushy plants, and they typically produce white or purple flowers – they are also known to produce red or purple fruits. If you notice any signs of these in your yard you’ll want to remove them as soon as possible, as all parts of the plant are considered to be poisonous. Common ragworts are described as having lobed leaves that are blue/green in color, and yellow flowers that are shaped like a star. Since common ragworts do re-seed at a pretty fast rate, it’s important that you remove the first few as soon as you notice them to prevent future growth. Tip: common ragworts do produce toxins, so as you remove them make sure you wear gloves to protect your hands. Creeping buttercups are most commonly found in soils that are damp, so if you want to keep these at bay you’ll need to keep a close watch on how well-drained your soil is. These weeds have small but bright yellow flowers, and they grow and spread as quickly as they do as a result of their root system. Similar name to the above, but very, very different! You’re more likely to see creeping thistles in lawns that were just seeded or in bare spots of already existing lawns, and visually, they have light purple flowers – not yellow. Additionally, their leaves are said to be spiky, so you definitely won’t want to have them growing anywhere that you might walk! To remove these, you’ll want to use a fork or a daisy grubber. Daisy weeds are considered to be one of the most common perennial weeds that pop up in lawns. Their main characteristics include white petals that surround a yellow center, and you’ll be able to tell that these are in fact a weed by looking closely at the leaves – daisy weeds have green leaves that resemble spoons. If you’ve ever tried to remove daisy weeds by mowing you’ll know that they are extremely resilient, so you’ll need to invest in a daisy grubber to keep them away. Visually, you may recognize these better when they have a fluffy, white ball on top of the stem (we’re sure you’ve made a wish on one in the past), but before a dandelion becomes this, it is actually what looks like a yellow flower. Typically you’ll see these in abundance in spring and fall, and they’ll be easy to pick out since they can grow to be pretty tall. And though the best way to prevent dandelions from popping up in your lawn is to have thick, healthy grass, there are herbicides you can use to spray them that won’t damage your grass too. Henbits are winter annuals that produce pink/purple flowers on top of their green foliage. The good news with henbits is that for the most part, they are pretty easy to remove by hand. However, if you don’t catch them in time and they begin to take over your lawn or garden, you’ll want to opt for using a post-emergent herbicide to remove them. Don’t let an oxalis plant fool you into thinking it’s a clover! Although its leaves look like clovers, you’ll be able to tell the difference by looking for flowers – oxalis plants produce a cup-shaped yellow flower in both summer and fall. Since these are known to grow in shady and sunny areas there’s a good chance you might see them in your yard, but you can work to keep them at bay by adding mulch in the spring. 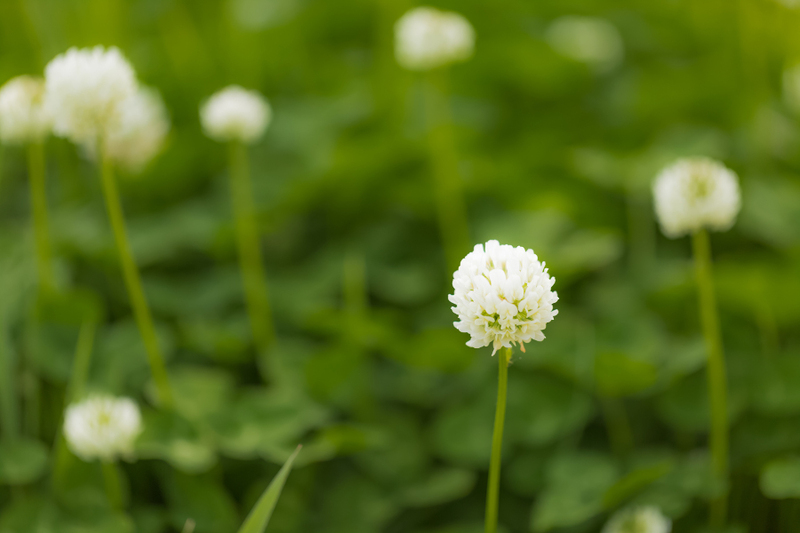 White clover weeds are normally found growing in soil that is rich in nutrients, and are best described as producing white or potentially even pink flowers. These too are perennial weeds, and they are known to have three-lobed leaves. You are more likely to see these particular weeds in areas of your lawn that receive sun and partial shade, and although we usually think of weeds as being a nuisance, these could actually be somewhat helpful since they release nitrogen into soil. Just like daisy weeds and white clovers, violets are perennial weeds. These produce flowers that are either white or lavender in color, and although they may look pretty, they can become pretty invasive and difficult to manage if you don’t treat them with the proper herbicide quickly. Generally speaking, these weeds appear in thin lawns rather than thick, so check shady areas of your yard for signs of them (grass is typically thinner in shady spots). The next time you head outside and notice what you think are flowers, we encourage you to look more closely – truth is, you may have some weeds on your hands!